Reliability has been...how do I put this....exceptional! Even a Lexus RX would blush so far. If this WK2 were my uncle it would be the one that worked. And the maintenance! I’m no mermaid so I don’t math too well, but you don’t need algae bra in order to tell this thing has been pretty darn cheap to run! I purchased the WK2 in August 2015 with 34,000 miles and we are now halfway through July 2017 with 120,000 miles. No repairs and only one recall to replace sun visors since they could catch fire. FYI, “Catch Fire,” appears in 90% of FCA recalls. Upkeep has cost me just about $2,700 which includes four $200 tires and installation, 14 oil changes, some cheap filters, wiper blades, rear driver’s side turn signal bulb, spark plugs, and windsheild replacement. Im doing spark plugs every 60,000 miles instead of the recommended 30,000 miles. I got my quartet of Michelin Defender LTX M/S tires when the WK2 had 43,000 miles on it and they will need to be replaced before 130,000 miles from the looks of it. That means I’ll have driven well over 80,000 miles on them. The original factory Michelin Latitude Tours did half that mileage with the original owner. There is a spot around the top of the rear window that allowed water to run into the headliner inside the trunk. Durability is pretty low as far as body, panel, and paint integrity. Cruise control enabling and keyfob recognition have about an 85% chance of working, but that probability is very noticeable when you drive a lot and enter/exit/turn on your vehicle over 12 times a day. Would I Recommend or Buy Again? Yes and yes! But I think the 2012 and 2013 model years were the best from this generation as far as ease of use and ownership. I’d buy any Grand Cherokee again to replace this one, I’m sold on the entire model line right now, even the unreliable ones. 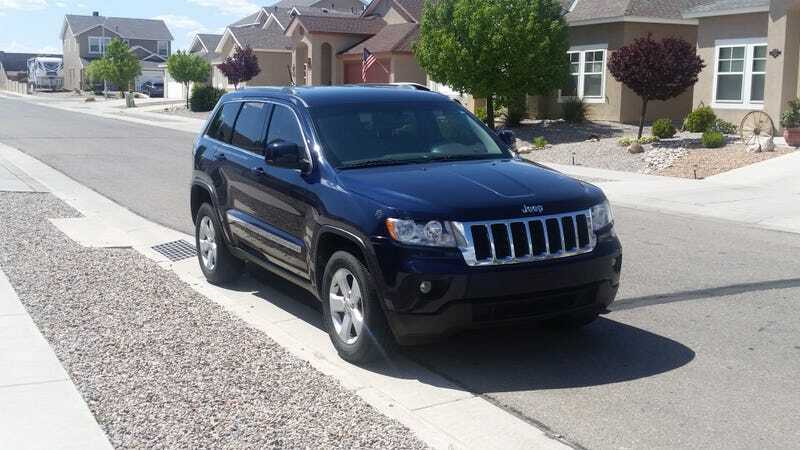 Mine is a RWD 2012 Laredo X with the 5.7L, which I decided would be the most reliable, simplest, and best value for what I needed. Plus V8, RWD (excessive highway driving in the desert), and a 6-speed with a ghost’d 3rd gear upshift. This is dead on my spec, features, and value. Im going to replace all fluids and get it throughly inspected by the dealer since it’s 6 years old and I notice more issues occur due to the age of vehicles rather than the mileage. I also need to do four tires again, spark plugs, brake pads, and another battery since I’m sure this one is three or more years old. After all that, I’ll take it to 154,000 miles (that should be July 2018) look it over and then go for 196,000 miles (which would be July 2019) if it’s still doing work duty. I’m hoping to retire it from daily jobbing by 172,000 miles (Winter next year) that way I can just have it around for when I need a crossover. Plan is to keep this and the Amanti as long as possible since I’m doing all cash from here.